creative savv: You know this, right? You can use leftover cooked grains (like rice and oatmeal) in muffins or other quick breads, by running them through a blender or food processor along with other liquid. 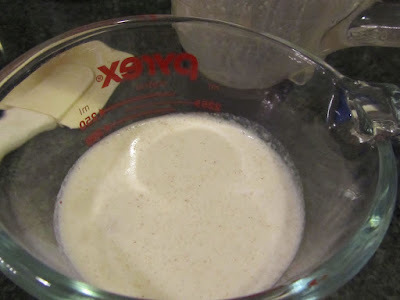 Then add to your batter as part of the liquid portion. 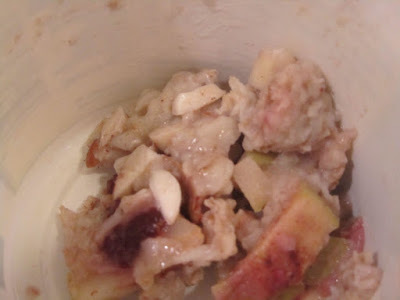 A week ago, Sunday, I made a large batch of cranberry-almond-apple oatmeal, for breakfast. There were leftovers, which I worked on myself all week long. By Friday afternoon, I realized that I'd better use what was left, before it developed mold. So, I ran it through the blender along with part of the milk for the muffins that I was making. Voila -- Ginger-Pear muffins (with the blended oatmeal as my secret ingredient!). In the past, I've also used plain, cooked rice, this way, in muffins, and seasoned rice pureed with milk, as liquid in savory biscuits. A plain or sweetened, cooked grain will work in banana bread, as the small amount of milk usually called for, or, as liquid in a coffee cake. It works very well, and the oatmeal or rice is practically undetectable (with the exception of an odd piece of nut, here and there, when using a grain cooked with chopped nuts). 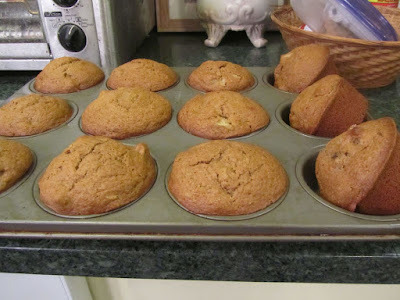 This trick works best in a muffin or bread which is going to have a small amount of texture, anyway, such as my Ginger-Pear muffins, with the chunks of pears baked in, or, in the case of using cooked, brown rice, adding to a batter for a wholegrain muffin. 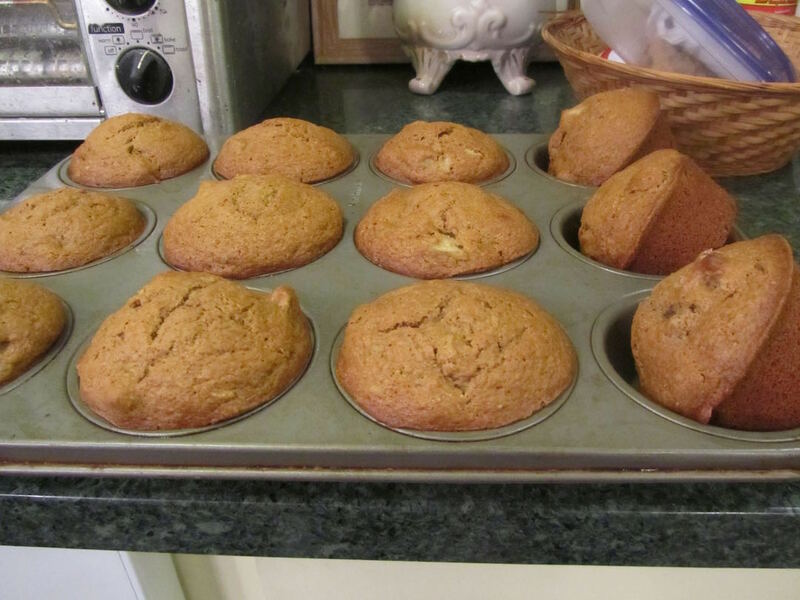 Just like meatloaf, muffins are a good place to "hide" a lot of things. I'll remember this tip the next time I'm baking muffins. Well actually, we don't eat many muffins, so I'll try to remember this the next time I bake a quick bread. Oh, right! meatloaf is also a good medium for leftover-hiding. I remember that vividly from eating in the college dorm! Although, they didn't always puree stuff to hide it, and we would find an odd carrot bit or pea, here and there in the meat. Great idea! I haven't really done much along those line, but need to try it more, I think. Having just read Tamar Adler's book, An Everlasting Meal, I have been inspired greatly to use up those "bits and pieces" often left in the fridge. I know you are already quite a master of this as well. :) Sunday evening, I used some leftover cooked rice along with 4 leftover hot dogs to make hot dog fried rice for a light supper. It was quite tasty, if I do say so myself. That sounds like an interesting book. Your hotdog fried rice sounds pretty good, and was a great way to use up 4 hot dogs, and feed the whole family. Good job!! Fried rice is a favorite of ours. If I make extra rice with dinner one night, then it's ready and waiting in the fridge. I would not have thought to add the hot dogs, though, so that is good to know! OT -- I always chuckle when I see the time stamp on your comment. I think to myself, "what is she doing up at that hour?" Knowing where you're posting from!! I hope you went back to bed and got the rest of a night's sleep. now back to frugality -- you know, you and your husband make a very good team. You do a lot of research to find new ideas, and he implements them, adding his own creativity and spin. I never would have thought to add curry powder to bread, either. Although, I can see how it could be good. I never would have guessed that basil or pesto would have been good in bread, until I tried some basil bread at the farmer's market. Someone, somewhere has to think these things up. There are possibilities too numerous to count. We just have to open our minds a little. Yes, I usually wake up in the middle of the night. This morning we both were up by 3:00 am so husband and I got in the car and headed for our commute. The traffic is so bad, takes one to two hours just to get to work and the same amount of time coming home. So we find ourselves leaving earlier and earllier and that is breaking up my sleep (maybe the biggest reason to retire). Even though our work is menial, I feel there is a lot of pressure since we're self-employed, and therefore, unemployed between jobs. I go to sleep worrying about our work, since I'm a perfectionist. I told myself in order to continue work another year, I should not care so much, but after 20 years, I guess I can't change. Thanks, Lili, your observation and memory of your reader's lives is so welcoming. You nailed it correctly, I'm the ideas and paperwork person (even in our job) and husband is the one who implements. But then, I'm also the quality control person lol The curry bread was very tasty. He said he added only garlic powder with the curry to the usual recipe. You're right about the endless possibilities with cooking. Knowing just the principles of food preparation, and going from there. that's a nightmare of a commute. My daughters do the same thing to get to classes/summer job, up to 2 hours each way. And my dad had a similar commute, as well, in So. CA, for years. It really does drain a person. I don't think of you all as just readers, you know. I think of you all as friends! I've added cooked grains to muffins before, but usually as whole grains -- to add interesting texture (in addition to using up the grains). I've never thought to puree them. May have to give this a try. Adding the grains, whole would really give a nice texture to breads, as well. And not much different in adding moisture than say adding a chopped fruit. Sounds yummy! What a timely post! Last week I wanted to use ingredients up to compose a noodle, cheese, meat, tomato sauce recipe before they all " turned"
I was low on a meat until I remembered a package of homemade hamburgers that had been grilled a bit too long and they were kind of like hockey pucks. What a fantastic save on those leftover, cooked meat patties! I will remember that in the future. I wouldn't have thought to puree cooked meat patties. Well done!! And I'm glad the casserole turned out yummy and could use so many leftovers! I've never tried this! We occasionally have leftover rice and this would be a good use. Never any leftover oatmeal around here--I even like to snack on it when it's cold. Weird? Oh well, it gets used. Yes, this works well with leftover rice. And it just makes incorporating the rice into muffins or bread an easy thing -- no clumps of cooked grains in the finished product. Kris, my son jokes about cold, congealed oatmeal, in our house. He's usually the last one to eat any of the oatmeal that I make on Sundays. And the oatmeal is usually a solid block at this time. He always says, "I guess I'll have a *slice* of oatmeal, now!" I'm in good company, then! Leftover oatmeal is a tough one to unload in our house, so this works super well for us. I'm late on this subject, so maybe no one is still reading it. But I did want to mention, in case anyone does, that I've actually used a regular old pastry blender to add cooked cereal to the dry ingredients of muffins--like you'd cut in butter or shortening for biscuits-- and then added the wet ingredients and mix as usual. Funny that you should comment on this today -- I just used leftover ginger-pear oatmeal in a batch of pancakes this morning, and I ran the oatmeal/pear/nut combo through the blender with the milk and oil before combining with the flour. Yours sounds like a great way to use leftover oatmeal, too. I'm pretty lazy, myself, at times, so I can appreciate trying to find a less time and effort method for just about everything. My blender isn't much of a deal to clean up. Nothing has to be assembled, it's just the jar and the lid. And, it goes into the dishwasher. The stand is kept in the cupboard to the left of the counter where I use it. So I do use it almost everyday. (I make smoothies several days per week, too.) I'm the same way about my food processor. Only because my food processor is a bit heavy, it lives on the counter full-time. I use that many times per week, and use the dishwasher to wash it, too. Love my dishwashers!!! I'm so glad you brought up this subject, because I happen to have lots of cereal in the house, and think I'll be cooking it and using it in place of flour and some other ingredients for a while, until things balance out. I make a large pot of oatmeal on Sunday mornings, not knowing how hungry everyone will be. So I usually make way too much. During the week, it's mostly me who will work away at finishing it all. But there always seems to be about a cup of it left by Thursday or Friday of the following week, and I have long since tired of that batch, so I look for ways to use it up. Sometimes, I just freeze what's left. Then in a few weeks, I have enough to combine into one pot, multi-flavored (since I add in lots of fruits, nuts, flavoring, spices), but it al seems to go okay together.